To empower parents to raise confident, respectful and resilient children through a program called Parent Effectiveness Training. To empower individuals towards personal mastery through a program of communication skills called Be Your Best and also known as Personal Effectiveness. Classes on this site are offered across Victoria, ACT and New South Wales. Go to; Timetable now to find your nearest program. 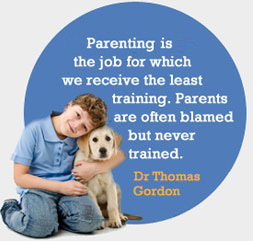 For other states go to; Australia Wide for all Accredited Instructors of Effectiveness Training Institute of Australia ETIA Ltd.
Dr Thomas Gordon, is the author of the world’s number one selling parenting book and parenting program, “Parent Effectiveness Training”. P.E.T. is the most widely respected, researched and admired parenting program and is now delivered in over 45 countries.